That Poppy is an american singer. Her debut EP Bubblebath came out on 10th of June, 2016. 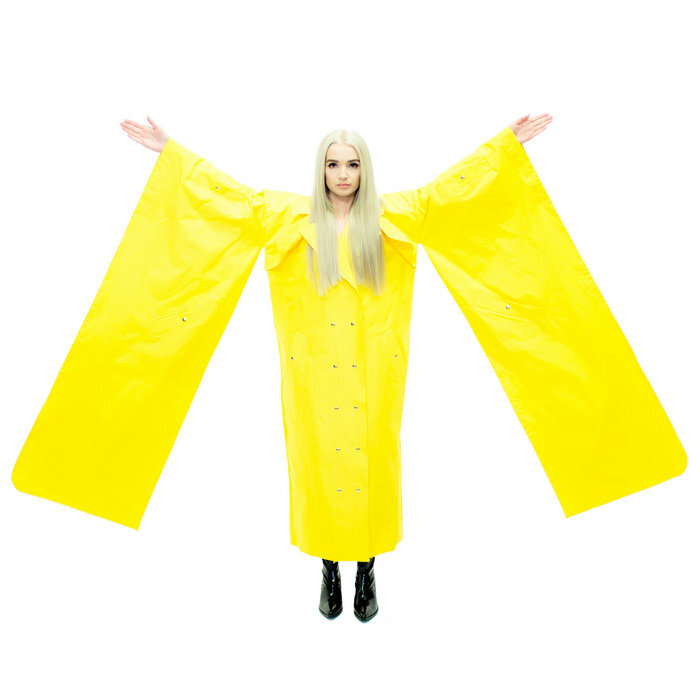 She also posts videos on her youtube channel "Poppy". Oh interesting, thanks for sharing I'll dig a lil deeper ! The first pop musician I've seen who is literally an Illuminati wannabe, but after seeing that all of her videos are written and directed by Titanic Sinclair, I'm not even a little surprised. I love her so much! Such an interesting musical project imo. I find her so interesting. I could watch her videos all day, they're so intriguing. I just love her entire aesthetic. I love her music too.. Lowlife is phenomenal. Altar and Money are great too. American Kids is kind of cliché and I didn't care for it upon first listen, but it's definitely grown on me. It's also nice that's she's kind of just as weird in person and in interviews. Love love love her. What do mean by that? I absolutely love this... it's so beautiful the way she sings it. Haunting, almost. She actually had a fairly successful music career before she changed her style. Her old merch from 2013 is still on District Lines, and they don't sell merch for just anyone. I have an old song of her's called Doesn't Mean I'm Wrong. If you try to view her Twitter or old YouTube channel in the web archive, you can't. Her people requested them to be removed; most likely to protect her new image. Although, not all of her tracks are covered if that is what's going on. The name she uses for songwriting credit is Moriah Rose Pereira (I have reason to believe that that is her real name). I'd say she's at least 24-years-old. She's lived in Franklin, TN as an adult and went to middle school in Boston, MA. If you try to view her Twitter or old YouTube channel on the web archive, you can't. Her people requested them to be removed; most likely to protect her new image. Although, not all of her tracks are covered if that is what's going on. I've read from a fairly (using this lightly btw) reputable source that she's like 15 years old. Where are you getting all of this info? I was actually going to post in here to ask if anyone found out how old she really is. I assumed she was around 23-24 too considering she befriended/appeared in multiple videos with Sam Pepper ( ) in 2013 so she couldn't have been much younger than 18 plus the photos of her going back at least 4 years online, but I had no idea that you can't view her profiles on the Wayback Machine.